A brilliant bouquet standing 5-6 feet tall for that Very Special Girl! 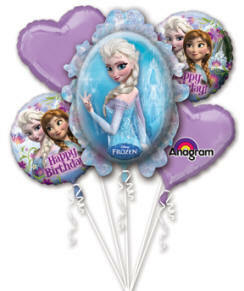 Option #2: Bouquet as shown, with six latex balloons attached to foil weight, $49. Option #3: Bouquet as shown, attached to a gift bag of treats including frozen activity book, frozen book, candy, chocolates, and popcorn to celebrate the birthday!, $60.